The day began like any other, and it was an uneventful morning of running errands in town. After lunch, I walked out front to get the mail, and I thought I heard hoofbeats at the end of the long driveway. Curious. I walked out there, and there in the distance I could see a tall man in a cowboy hat riding a massive jet black Friesian up the road. Oh my. Be still my beating heart. He approached, dismounted, and strode confidently toward me. I’ve never believed in love at first sight but this was it. Head over heels, smitten, I’d found my Prince Charming, my Farmboy, my Han Solo, my knight in shining armor. The skies opened and the angels sang. Literally. Bluebirds and robins draped fanciful ribbons in my hair, and chipmunks and bunnies frolicked at my feet. We talked for hours, and learned that we were perfect for each other... He handed me a single red rose, and said he’d be searching for me his whole life. I practically threw myself into his arms. He asked me to join him for dinner at his ranch and I eagerly accepted. With a few quick words into his cell phone, minutes later his private jet landed in the field next door. We (and the friesian too) boarded the jet and flew to his castle… in Jackson Hole (“all the barns and chicken coops are heated this time of year,” he said). It was a spread of thousands of acres, endless trails to ride, endless animals to photograph. We dined on steak and garlic bread and mashed potatoes… and cheesecake. Lots of cheesecake. After dinner he gave me a tour of the castle. The bedroom was lavishly decorated, and beautifully adorned in my favorite colors. There was a huge canopy bed with silk sheets. He took me in his big strong manly arms, and…. Olin jumped on my head, and I woke up. And it was a day like any other. No flowers, no hot dates. I did make a chocolate peppermint angelfood cake though. 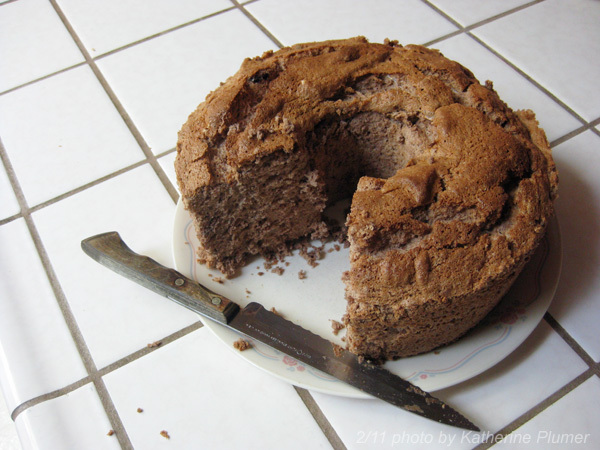 If you’ve never had a home-made angelfood cake, you are seriously missing out. Thanks for the angel food cake reminder. I haven't had one in years and I'm sure it would qualify on my weight loss plan. 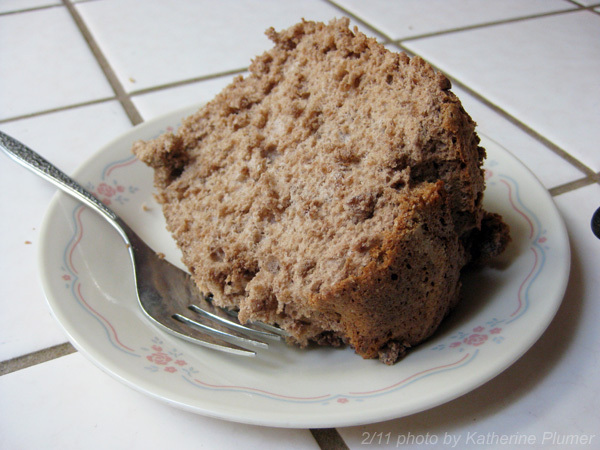 I just love home made angel food cake, plain, chocolate, or with tiny bits of bittersweet chocolate. Dale- my other favorite is chocolate coconut.